1 POUR oil into large pot and heat. 2 FRY potatoes in hot oil until golden. Drain on paper towels. 3 SPRINKLE with salt and serve with Hellmann’s® or Best Foods® REAL Ketchup. FOR GARLIC PARMESAN FRIES, combine 3/4 cup grated parmesan cheese, 2 tsp. minced garlic and 2 tsp. chopped fresh thyme and sprinkle over hot fries. Want to save time? 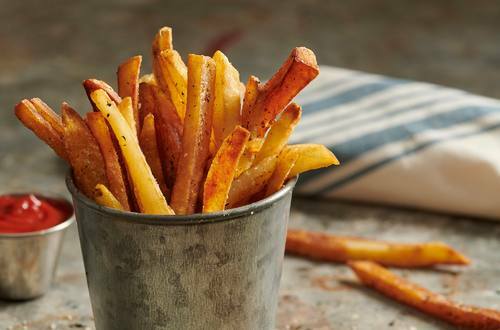 Use a bag of frozen French fries. Follow package directions, sprinkling with parmesan mixture during the last 5 minutes of cook time.